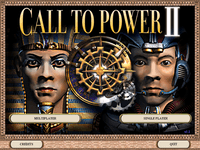 Call to Power II (CTP2) is a PC turn-based strategy game released by Activision as a sequel to Civilization: Call to Power, which was, in turn, a game similar to the Civilization computer game by Sid Meier. The game could not have "Civilization" in its title because the word is trademarked by the makers of the original Civilization series. In October 2003, Activision released the source code, enabling the Apolyton gaming community to debug, improve, and add new features. Call to Power II (CTP2) had a number of differences from the previous Civilization: Call to Power (CTP). CTP was criticized for its user interface, which prompted a redesign of the user interface in CTP2. CTP2 also included several gameplay differences. Maximum army size was increased, some balance adjustments were made to avoid the balance problems from the original CTP, and the economic system in CTP2 was reworked so that controlling good terrain became more profitable. Another difference in CTP2 is that the player can receive bonuses for certain achievements, if they are the first to perform the action (recapturing a city, sailing around the world, etc). The diplomacy model in CTP2 was improved, with more agreements available for negotiation. Players could, for example, ask the AI controlled civilizations to stop researching some technology, or to reduce their nuclear weapons arsenal. Space colonization and the space layer were removed from CTP2, along with the "Alien Life Project" victory condition. CITP introduces a new victory condition which requires the player to cover most of the planet's territory with Gaia sensors and build the Gaia controller wonder, winning the game.